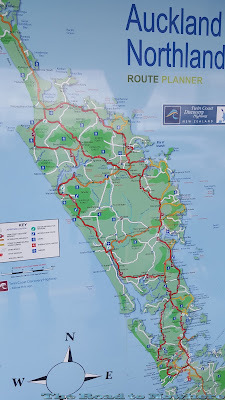 I was concerned that today's ride that was going to take us through Auckland, New Zealand's largest city was going to get us lost yet again. 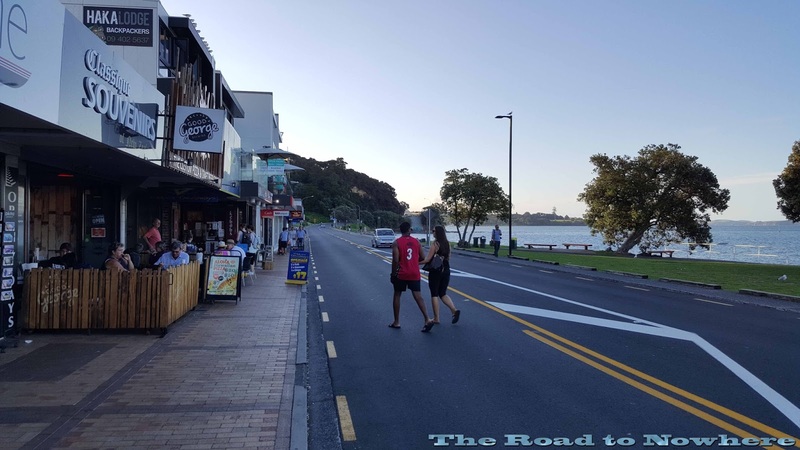 I checked our exit number on the motorway via my smart phone and as it turned out we had nothing to worry about, it was quite easy to get through Auckland without any dramas as signage was good here. 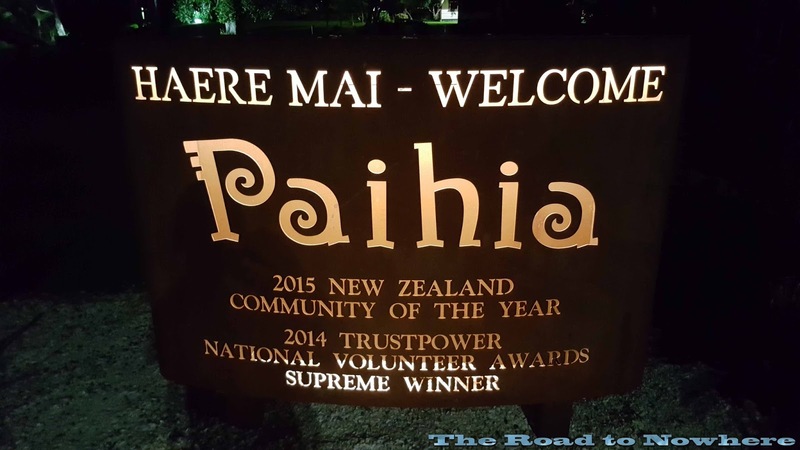 We stopped at a little place called Waimauku for some breakfast. I had to stop and clean my visor at the petrol station as I couldn't see out of half of it. After breakfast we were on some back roads again and we checked the map. There were a few turns to take just out of town so we all agreed to take it easy till we get to those turns. I saw 2 bikes in front wizz straight past the first turn less than 5 minutes after we spoke about it, so I pulled over and told Stu to wait and I chased them down and we turned around and went back. All this after yesterday's events too. Sweet baby Cheeses. 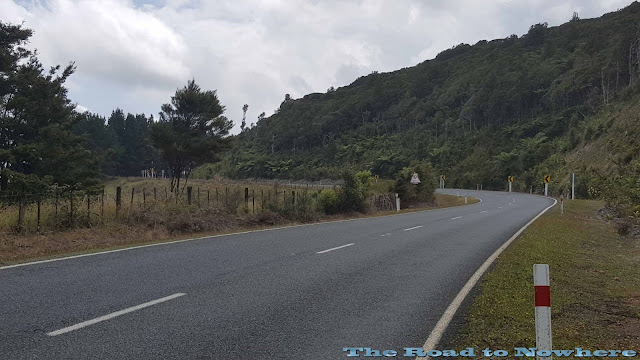 The riding up to Wellsford along here was quite good but the road was more open and sweeping than tight and we were making good progress, much more like riding at home in Australia. As we got back onto the highway I could see the weather ahead turning bad and it looked like we might be going to get wet again. 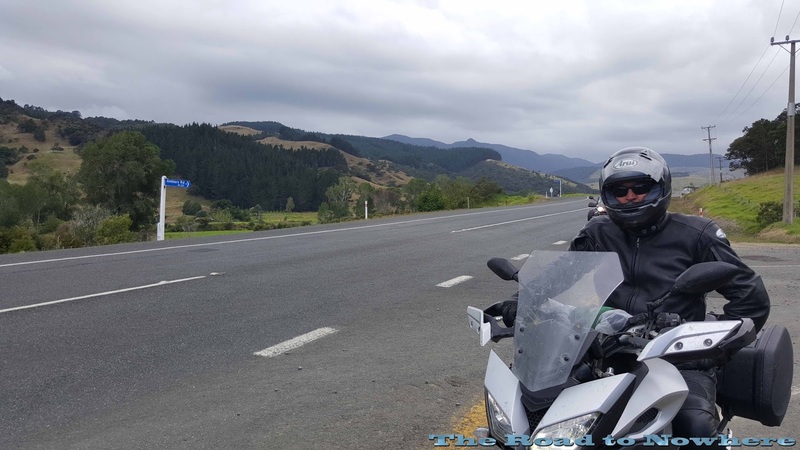 It just started to sprinkle with rain just as we turned left at Maungaturoto and headed towards the coast and blue skies we just managed to doge the rain luckily. 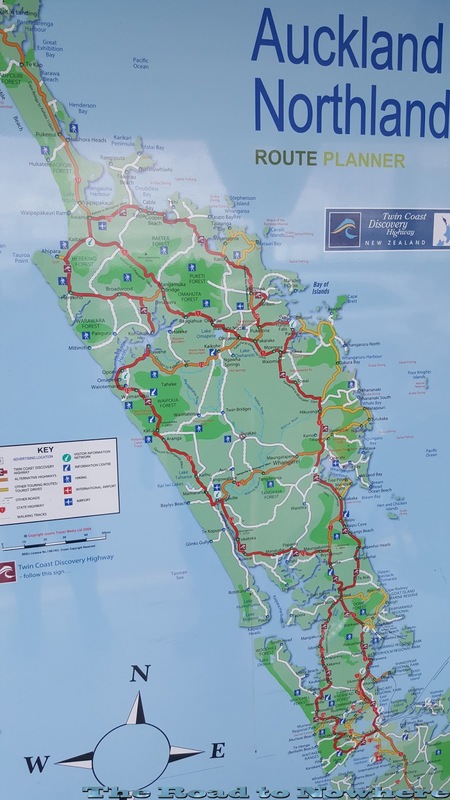 We were following the Twin Coast Discovery route which was a good ride. 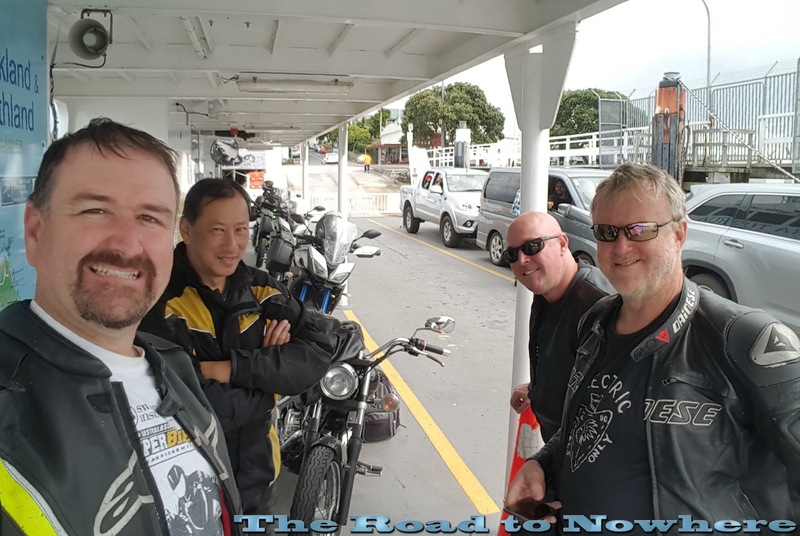 We stopped in Dargaville and got fuel and then kept riding. The roads around Dargaville were flat land riding with big open views ahead. After Dargaville the road started to get a lot more hilly again as we approached the Waipoua Forest. I thought I'd stop and take a photo of this sign as I'm not likely to see one of these again. 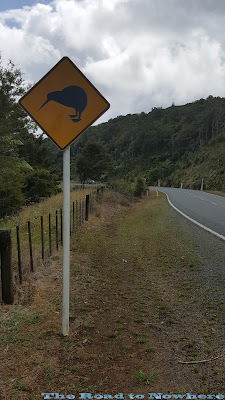 It's not everyday that you see a kiwi sign, err unless you live in kiwi land that is. 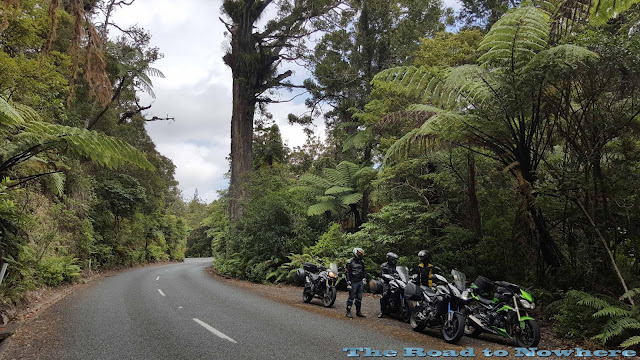 We continued on riding as the road went from flowing open hilly roads to a tighter twister forest lined road. The tree's and forest along this section of road were right up to the edge of the road, if you run off here you would be ploughing straight through into the forest. 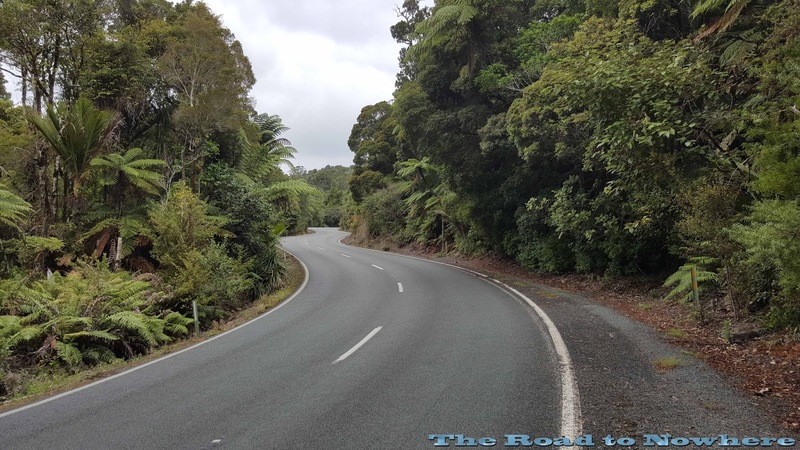 This road was very twisty with about 20kms of 35-55km bends winding it way through the forest. None of the bends are sign posted with the occasional rough patches but most of the road was in good condition. It was a lot of fun riding this section. It was also very hard to stop and take photos as all you could see was the next bend and forest. I was having an absolute ball along this section of road and didn't want to stop but I had to force myself to stop for a photo otherwise I wouldn't have any photos to remember this place and it was very beautiful in its own right. Some of these tree's along the road verge are absolutely huge in size and there were thousands of them. I've never seen tree's like these before very unusual. 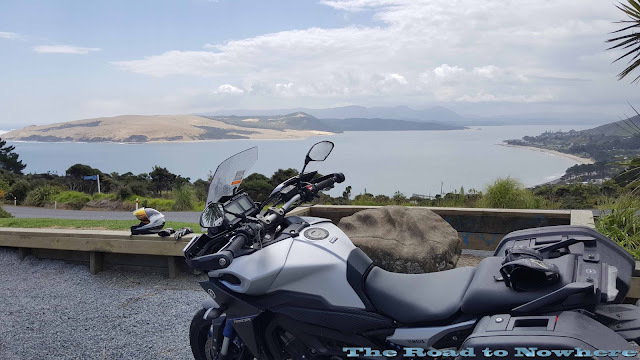 I could have quite easily turned around at the end and went back down to do these twisties again but we had a big day of riding planned for today at around 543km so we pressed on. Coming out of the forest again we came in to hilly farm land again, but it was still a lot of fun riding along here. The weather was starting to look foreboding with storm clouds in the distance. Cresting a winding hill we came over the rise to be met with this spectacular coastal view with a huge bay and large sand bank on the other side. Beautiful scenery which took our breath away. Geoff managed to stall the Black Pearl in the gravel in the car park but we easily got it going again as we were on a large hill. 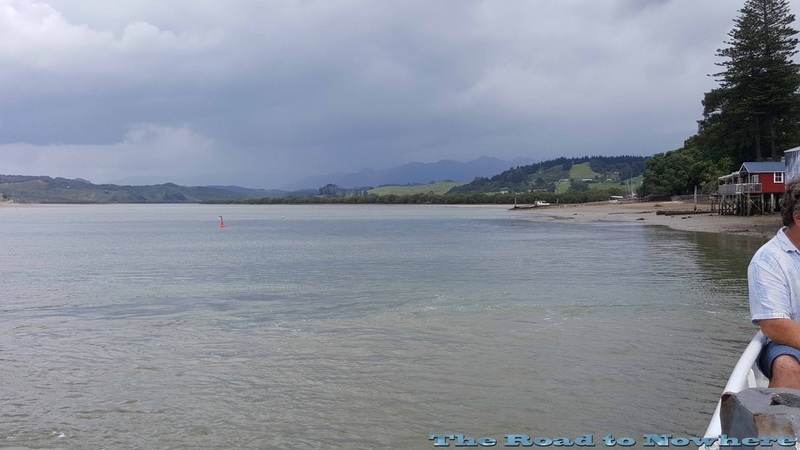 The road followed the coast around the bay and as we rode along we could see we were headed for rain, but we were turning off the road and crossing the bay on the Rawene ferry. We were in luck too as the ferry only crosses every hour we rode straight onto the ferry as they just opened the gates, no waiting whatsoever. We couldn't have planned that even if we tried. 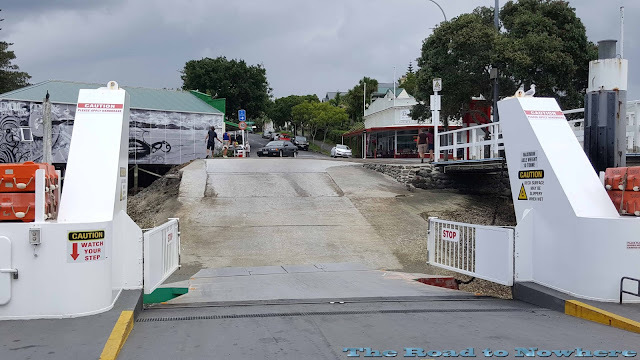 So we actually didn't see anything at Rawene because we zipped straight aboard the ferry. Straight on the Ferry, how good was that? From the ferry we looked out towards Paihia and it was raining along that section of road. I'm glad we were not going that direction. We crossed to the other side and continued along the Twin Coast Discovery route towards Herekino which just happened to be 2 houses as you never know what they will be like from the map, as we continued along here. The roads were wet in patches from the rain showers that had passed over before we got here but the road was a lot of fun and virtually empty as well. 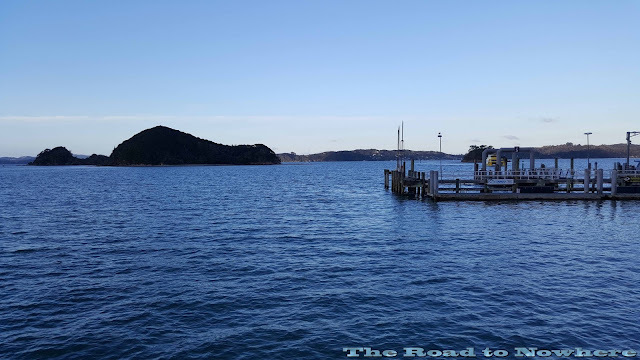 I was having too much fun to stop for photos along this road and didn't get any photos until Paihia. 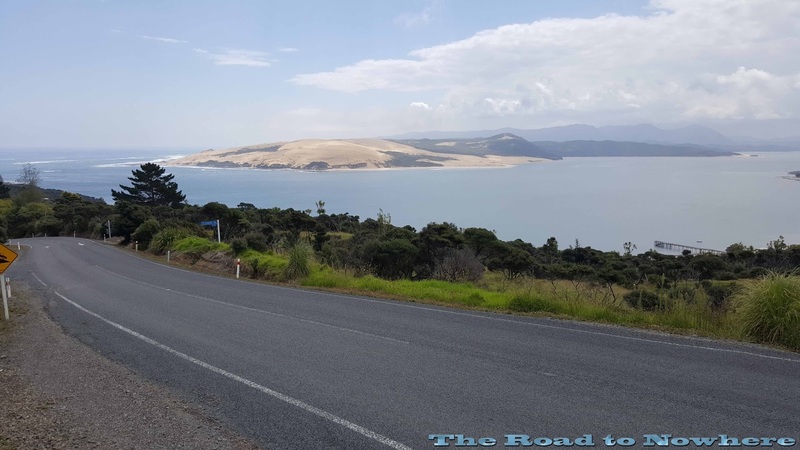 We continued to follow the road as it crested the top of the Island and started to then head down along the Eastern side of the coast and towards Paihia. Some of the coastal countryside along here was very beautiful but sadly I didn't take any photos. 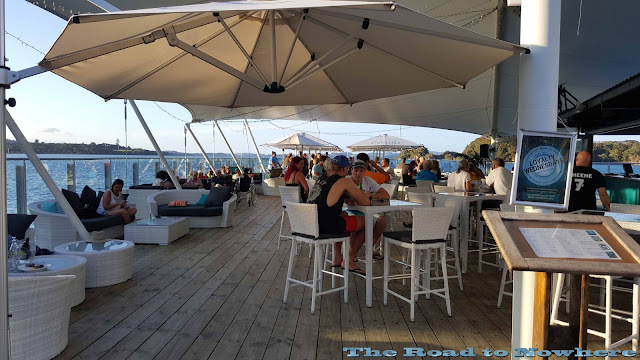 We rolled into Paihia along the beach front late in the afternoon. There were a lot of people still around out on the beaches soaking up the rays. 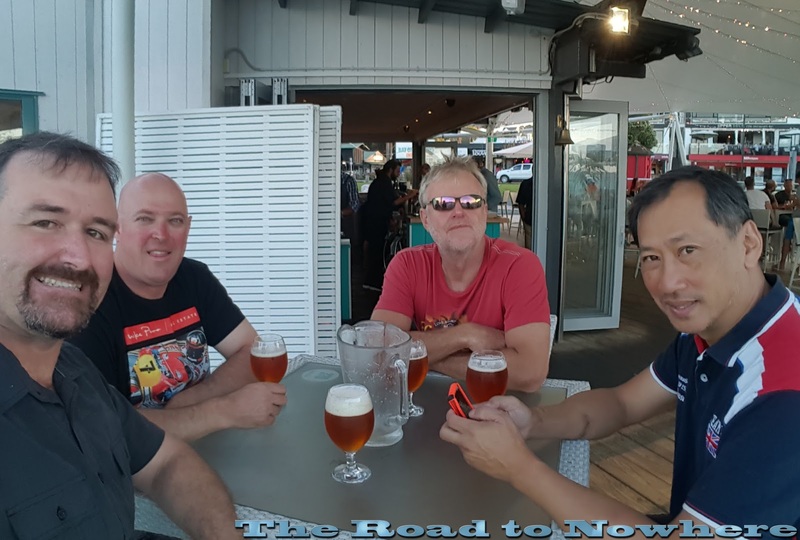 We made a beeline to our motel and then headed down to the waterfront for beers and some food. We chose to sit right on the water front which had some excellent views over the water and the prices reflected this, but we didn't care it was really the last proper night of the tour as tomorrow was really just the run back into Auckland to hand the bikes back. There was live music here as well and we had a few jugs of beer and ordered dinner. Come 10pm and we were struggling to find anything still open. One thing I noticed in each of the places we've been to is that come 10pm most things have closed and there's no one around, its got that small country town feel to it. We were staying in the Tanoa Paihia Hotel which had decent and cheap accommodation and only a couple of minutes walk from the centre of town. I did take my gopro but it only came out twice, as did my cannon camera which only came out once. All these photos are from my smart phone. Geoff bruise did get bigger and blacker over the days after. Now that sounds like a fabulous day of riding with no major issues. Stunning views too. The rainforest looks beautiful. Sure was a good day, the ride through the forest was a highlight of the day. Beers on the waterfront was good too. 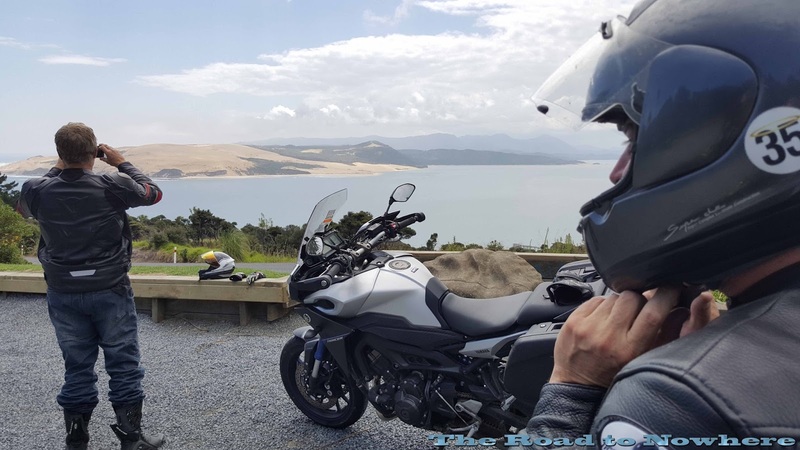 I guess the ride is nearly over but it's been great to get your perspective on riding in my back yard - loving the write-ups! Mate your nuts, At night in a storm wouldn't be my idea of fun???? Much more fun in the daytime I think. Love the Waipoua Forest and so pleased you got to ride through it. 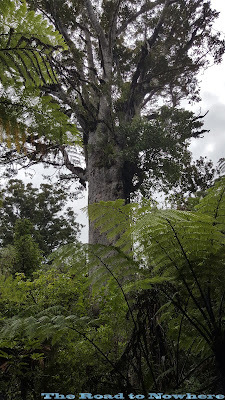 Those kauri trees are stunning. The biggest is nearly 15 metres in girth and 2000 years old! I came through the forest after midnight on one of the 1000 miles in 24 hour rides and it's a bloody scary place at that time of day. More awesome blogging Steve - you've excelled yourself mate! Thanks Geoff, High praise from you. It was a fun rollercoaster ride of roads and events and one I'll not forget anytime soon. 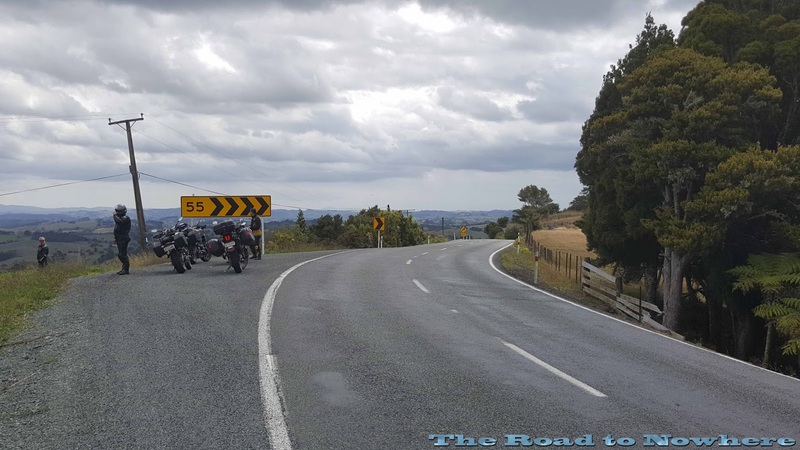 Geez what is it with you kiwis riding all the great roads after midnight in storms. Can you ride them like a normal person? Hahaha - I guess that's why the ride is called the Grand Challenge! Actually had a couple of close calls through the Waipoua Forest on that ride. There was a tree fern frond laying in the road right in a corner and only saw it at the last moment. Front wheel stepped right out but managed to keep control and my underwear clean. About 20 minutes later, we nearly hit a black dog wandering about in the road. Hard to see in the dark with no street lights for miles! Looks like you're having a great time in UnZud. There's something special about a longer motorbike ride shared with friends. Great stuff!! Thanks Theo these multi day rides are fantastic, its what bike riding is all about.